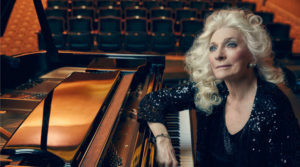 Internationally acclaimed singer-songwriter and Grammy Hall-of-Famer Judy Collins will be honored, along with a diverse group of 14 other outstanding artists, at the 34th Annual Bistro Awards on Monday, March 11 at Gotham Comedy Club, 208 W. 23rd St. As is the Bistro Award tradition, the evening will feature performances by the winners. Ms. Collins is receiving the Bob Harrington Lifetime Achievement Award, the Bistro Award’s highest honor, in recognition of the artist’s six decades of musical accomplishment. The award is presented by returning sponsor ASCAP, the performing rights organization. Ms. Collins is a longtime member of ASCAP. 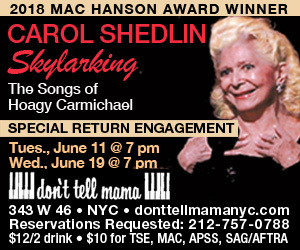 A classically-trained pianist, self-taught guitarist, and singer, Ms. Collins possesses a soaring, ethereal-yet-earthy soprano and eclectic taste that have allowed her to move back and forth easily through folk, pop, rock, standards, cabaret, and show tunes in her 60 years of recordings and performances. Her own writing skills have produced songs that rank with the iconic songs that she has covered. She has created a musical legacy second to none and she shows no signs of slowing down. Frances Ruffelle, who received a Tony for her performance as Éponine in Les Miz on Broadway, gives a dazzling performance in her ambitious and remarkable solo show in a run that has been extended into 2019. The Bistro Awards Committee celebrates this run with an award for Major Engagement. Lee Horwin, one of the best and most interesting singers to have emerged during the resurgence of New York cabaret in the 1970s, returned last year to play the iconic singer-actress Libby Holman. She is receiving a Bistro for her compelling Musical Portrayal. With extensive Broadway and television credits, Luba Mason‘s cabaret, jazz, and concert experience, both in the U.S. and internationally, is equally impressive. Her Vocalist Bistro is a testament to her beautiful fluid voice, her cool-to-fiery dramatic range, and her assured but charming stage presence. Sidney Myer is being recognized for Unique Artistry because there is no one else like him on the current cabaret scene. Reminiscent of a small handful of great comic artists, he can have the audience laughing with glee at a spoken or sung line delivery or an eloquent facial expression, then a moment later have them in tears with an understated but heart-wrenching rendition of a ballad. This year’s Ira Eaker Special Achievement Award—given to an outstanding performer on the rise and named after Back Stage’s co-founder, co-publisher, and first nightclub critic—goes to Patrick Swailes Caldwell, a “renaissance clown” who is fully entertaining at mime, magic, music, mimicry, and mayhem, all of it hilarious. True to the Bistro tradition of honoring outstanding work whether performed by a veteran artist or a relative newcomer, the Bistro Awards pays tribute to cabaret favorite Ricky Ritzel for his delightfully entertaining Musical Series, Ricky Ritzel’s Broadway, and to singer Sierra Rein for Debut. Rein made her first solo appearance last year with an impressive performance that covered the gamut from humor to drama, but with a strong emotional undercurrent that turned her show into a deeply moving experience. Writer and performer Daniel Alexander Jones will be honored for Performing Artistry for his alter-ego, the glamorous Jomama Jones, who shares both witty and serious stories and songs that explore easily identifiable and important issues of our times. Almost certainly the first banjoist to receive a Bistro Award, Singer-Instrumentalist-Bandleader Cynthia Sayer is not only a fine musician, she is also a wellspring of musical joy. Two singers are being honored for their outstanding work. Winning for Vocalist, Lisa Viggiano explores the hidden crevices of a song, and with her expressive voice delivers nuanced interpretations of great depth. In the Bistro’s choice for Tribute Show, Marnie Klar Sings Bobbie Gentry, Marnie Klar demonstrated that she has both the talent and the sensibilities to do justice to Gentry’s rich body of work. The Award for Director goes to Tanya Moberly, who in the past few years has guided not only these two performers, but other award-winning artists as well. Both Shirley Crabbe and Philip Chaffin are being honored for their Recordings. Crabbe’s new CD, Bridges, proves that she is a powerful jazz singer with solid musicianship and the ability to live inside the story of a song. The premise of Chaffin’s Will He Like Me? is to sing some of the best Broadway songs as a gay man’s love story, but this conceit quickly becomes secondary to his warm and personal vocals and the beautifully orchestrated songs. For the seventh year in a row, Shellen Lubin is directing the Bistro Awards show. A theatre director, playwright, songwriter, and vocal and acting coach, Shellen is also in the forefront of attaining parity for women in the arts. The gala event will be held on Monday, March 11 at 7:00 pm at Gotham Comedy Club. 208 W. 23rd Street. Sherry Eaker, the former longtime Editor-in Chief of Back Stage and the producer of the event since its inception, heads up the Awards Committee, which includes BistroAwards.com critics Gerry Geddes, Roy Sander, Robert Windeler, and Mark Dundas Wood. Sander is the award show’s associate producer; Wendy Lane Bailey is the assistant producer. Tickets range from $80.00 to $350.00. Ticket-buyers in all categories are invited to the “After-Bistros” supper party as guests of the Bistros. For details about the various ticket categories and early-purchase prices, visit www.BistroAwards.com. For additional information, call 917-239-5467. Philip Chaffin / Recording – Will He Like Me? The BISTRO AWARD has been recognizing, encouraging, nurturing, and educating cabaret, jazz and comedy artists for 34 years through its insightful reviews and annual awards. It is the oldest award of its kind in the industry. It was established by Bob Harrington in 1985 in his “Bistro Bits” column in the trade weekly Back Stage, then under the editorship of Sherry Eaker. For the first few years, the awards were merely listed in Harrington’s column as notable performances he had seen during the calendar year. The first formal presentation of the awards was held in 1990 at Eighty Eight’s, a popular cabaret venue in the West Village. From there, the show moved on to The Ballroom in Chelsea, and then relocated to the Supper Club in the Broadway District, where it remained for many years. This year marks the 12th year at Gotham Comedy Club. The guidelines that Harrington set up for himself to determine the first winners have become the basic philosophy behind the Bistro Awards, which recognize achievement in a wide variety of categories — from outstanding performances to outstanding contributions by members of the cabaret community. The object is not to choose the “best” of anything of the year, but to recognize and congratulate the accomplishments of those who have done something special. Accordingly, categories can easily be created from year to year as they best fit the year’s distinguished work. The Bistro’s special honorees have included André De Shields, Sheila Jordan (2018), Darlene Love (2017), Jon Hendricks, Annie Ross (2016), Ben Vereen (2014); Lainie Kazan, Maurice Hines (2013); Kaye Ballard, Melissa Manchester, Dee Dee Bridgewater (2012); Dionne Warwick, Carol Channing (2011); Mitzi Gaynor, Elaine Stritch (2010); Charles Aznavour, Liza Minnelli (2009); Marilyn Maye (2008); Betty Buckley (2007); Steve Ross (2006); as well as Cleo Laine and John Dankworth, Bobby Short, Eartha Kitt, Barbara Cook, and many others. © 2019 Bistro Awards. All rights reserved.